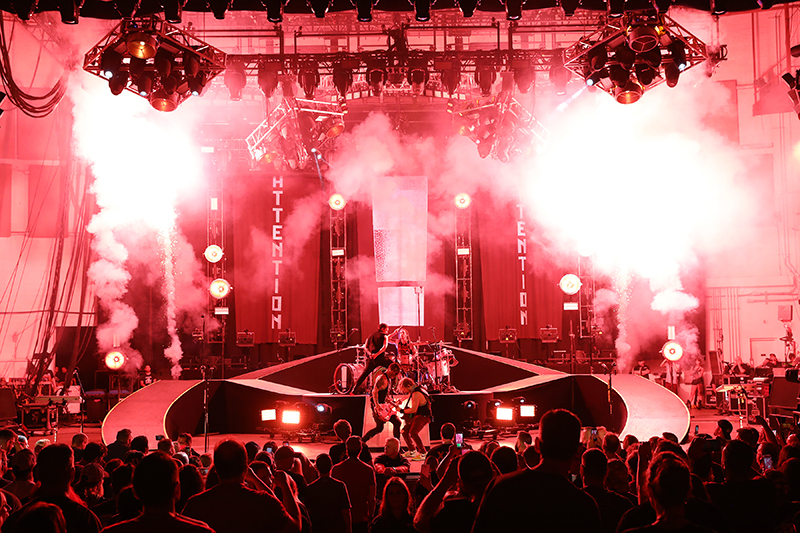 For the first six weeks of the tour, Shinedown opened the show, but now in the final weeks, Shinedown has taken over the final slot. Either way, one band loads out and the other loads in, and these seamless transitions get done in less than 30 minutes. This took some doing from the production teams, as they needed to design around each other’s needs. For Carter and Shinedown, this was probably a simpler process. They had just finished a European tour and had a rig designed and programmed. So, Carter got together with Breck, who had met with Sully Erna, the leader of Godsmack, who had some specific requests. Mainly, Sully had been thinking about a triangle themed look — one that would include three triangular truss pods set up in a triangular fashion flown above the band and moving into various configurations. 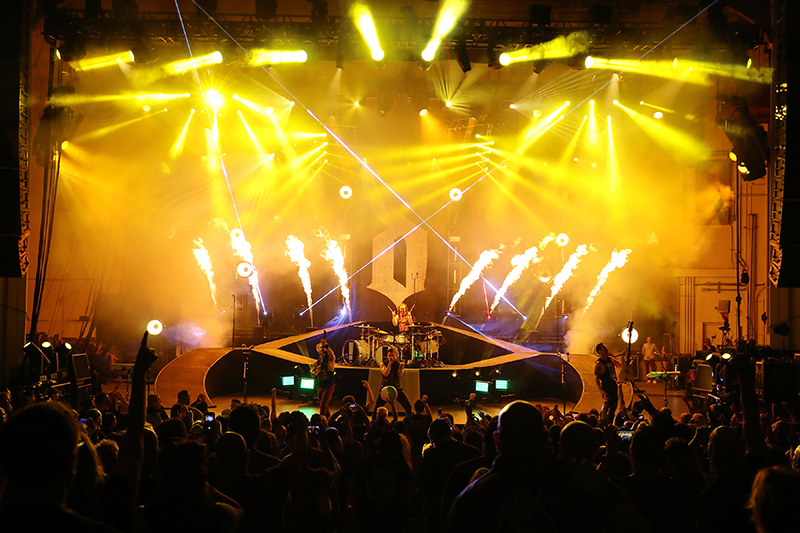 One band — Shinedown — wanted backdrops that could change their look along with lasers. 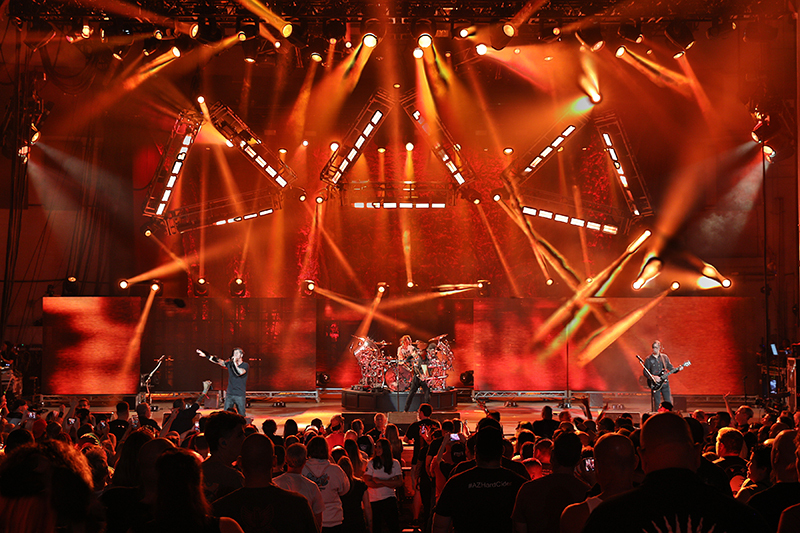 The other — Godsmack — went for a video presence incorporated into their look as well as floor lighting. 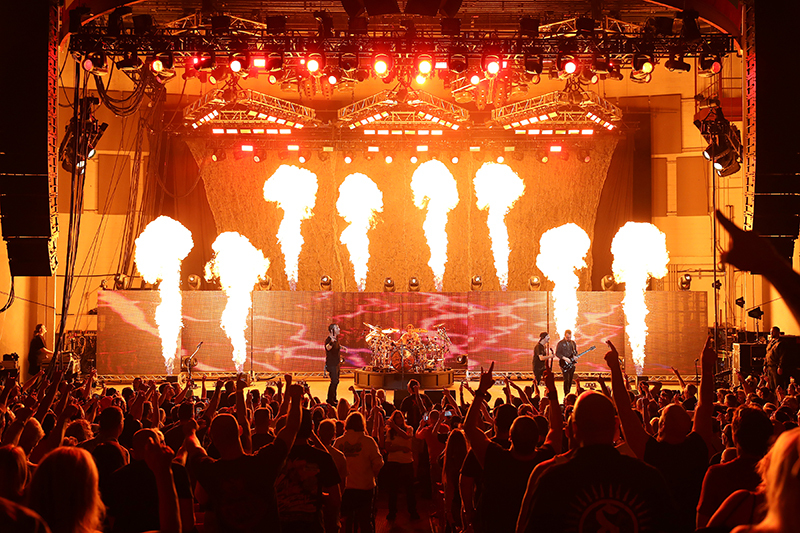 They both required pyro, and Pyrotek was behind the special effects for Shinedown while Stage & Effects engineering looked after Godsmack. For both acts, Bandit Lites out of Tennessee was the answer to their lighting gear. Three out of the 11 touring trucks were packed full of their lights. 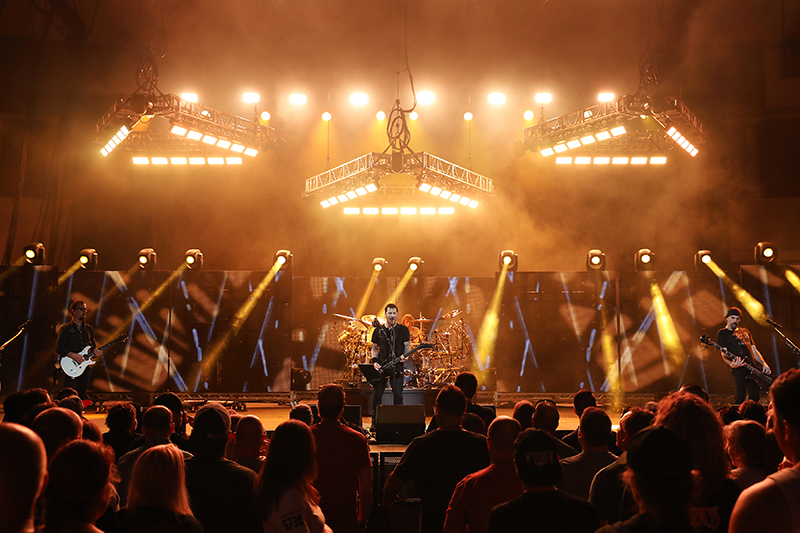 Carter Fulghum describes how the 2018 tour looks took shape for the co-headlining trek in support of the bands’ recent album releases — Shinedown’s Attention Attention, released May 4, and Godsmack’s April 27 release, When Legends Rise. “These two bands had met and talked about doing a joint tour for some time. Then last winter it looked like it was actually going to happen, starting in July,” Carter says. “Shinedown has done quite a few shows with Five Finger Death Punch over the years. This includes a run last April and May. I had no idea who Godsmack would hire, so I went ahead and designed a touring light rig ahead of time, with the hope that maybe I could keep it intact for the next tour. 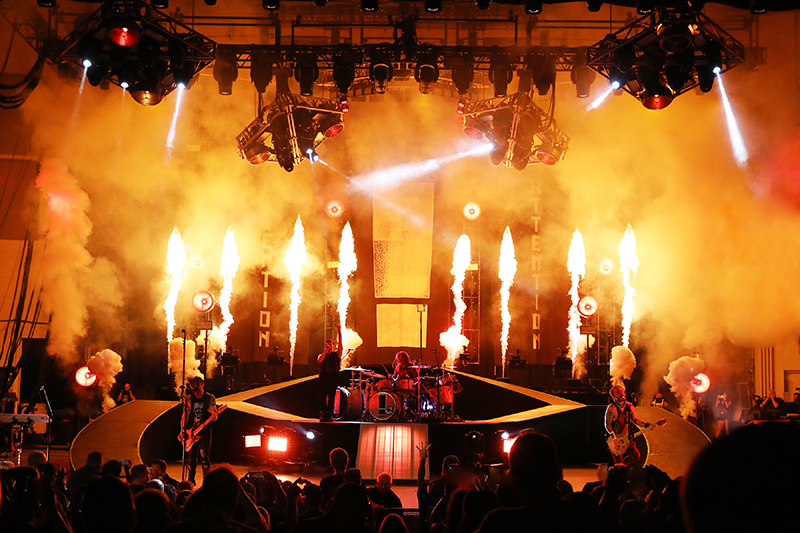 Breck pretty much kept the rig as it was and designed around it, making sure he kept his band’s intended look intact.” Bandit Lites, the preferred vendor for Shinedown, were once again called on for their services. 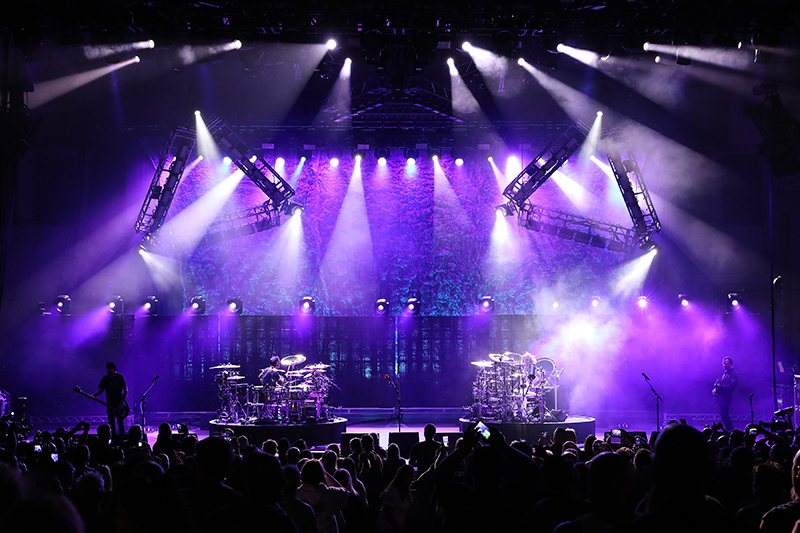 The lighting system consisted of a downstage, mid and rear truss as well as side light from a couple sticks of truss. They are generally full of alternating Martin MAC Vipers and Vari-Lite VL3500 Wash fixtures and a lot of Solaris Flares. The designers shared those elements. But as far as the pods themselves, they couldn’t have been more different. This included eight of Chauvet’s RH1 fixtures in each of the square pods, joining a couple of PATTs. “I love what these fixtures bring to the table. They give me the beam look I need, but with the two prisms I get some wide effects. 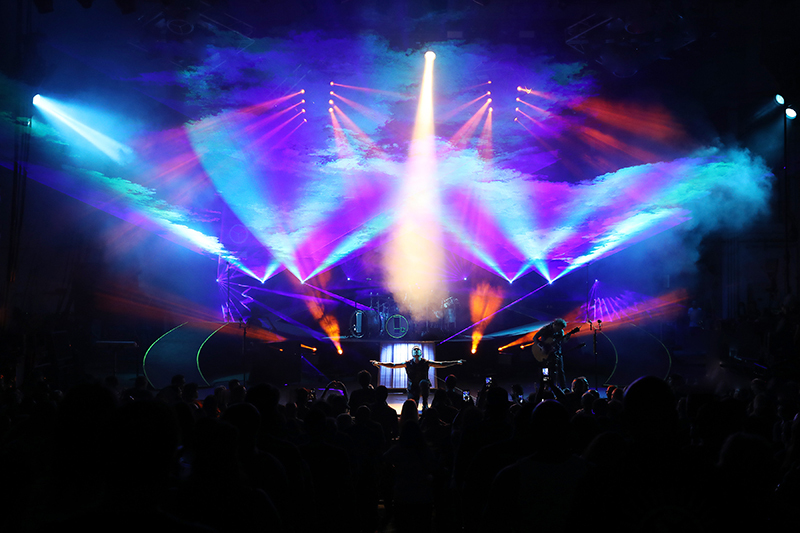 I get so much out of these lights.” In addition, he uses four Elation SixPars in each pod to tone them in color. He spec’d Elation Paladins for his choice of blinders. 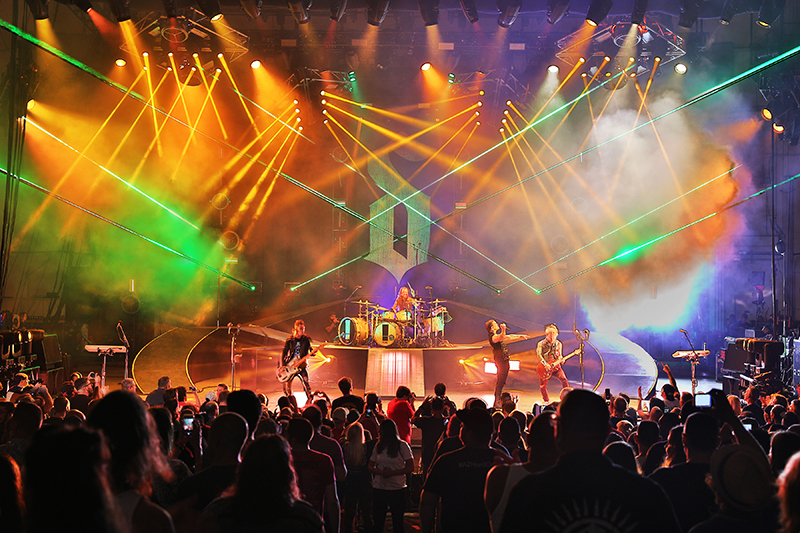 “They have color and are IP65-rated, so they were perfect for hanging on a downstage truss when you are on a shed tour.” Some Atomic 3000 strobes filled out the Shinedown pods. Upstage of the Shinedown set sits four vertical ladder trusses. They contain Elation ACL 360 Bars, Atomic 3000 strobes and more pixelPATTs. These trusses are masked by a crinkled bug screen drop that Godsmack uses in their set when they close the shows. Haggerty’s pods were simple, yet effective. 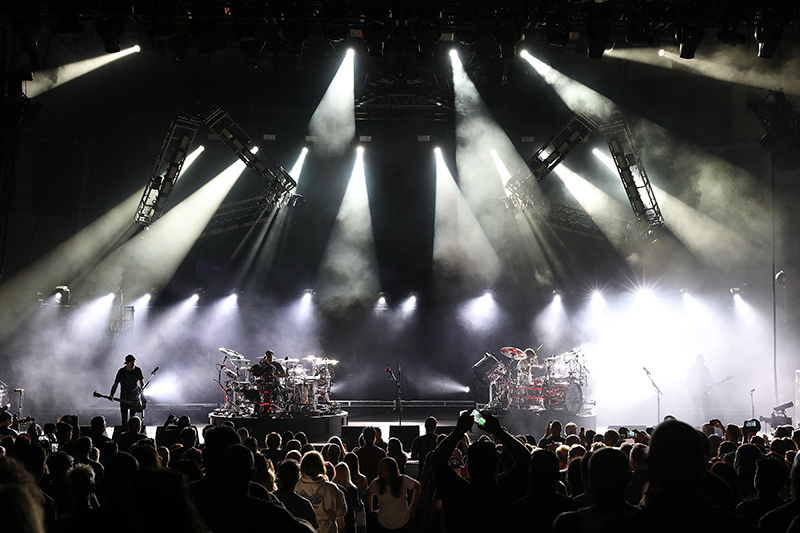 Three Isosceles triangles made from 10-foot sections of 20-inch truss were lined with six GLP JDC1 strobe wash fixtures — 54 in all. On the corner of each triangle sat a Claypaky Mythos fixture. And between their motorized tilt ability and the movement of the triangular pods, there were a lot of things the designer could do to make use of all the effects that fixture can handle. 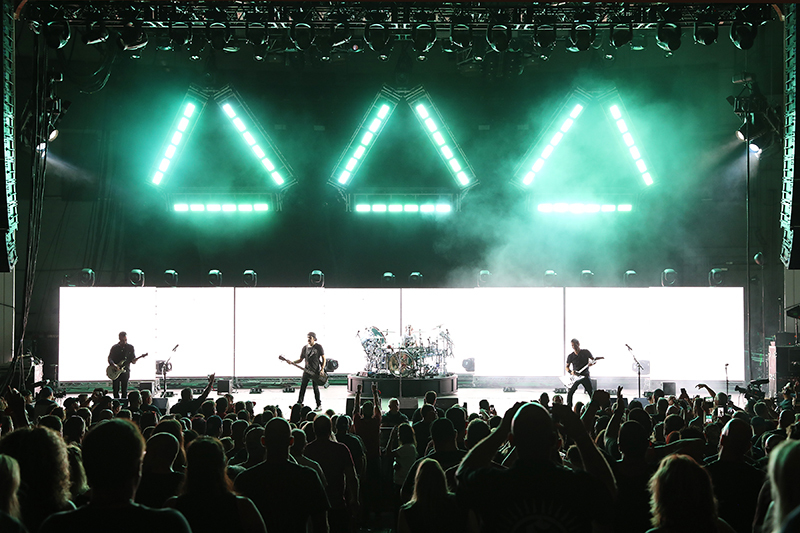 Rather than opt for any video elements, Fulghum spec’d a black backdrop that featured the band’s signature S+D logo stationed between two vertical trusses. Around the end of the show, three new drops appeared between the four vertical trusses, saying the words “Attention — Attention,” as in the name of their current album, sandwiched around the album artwork in the center. 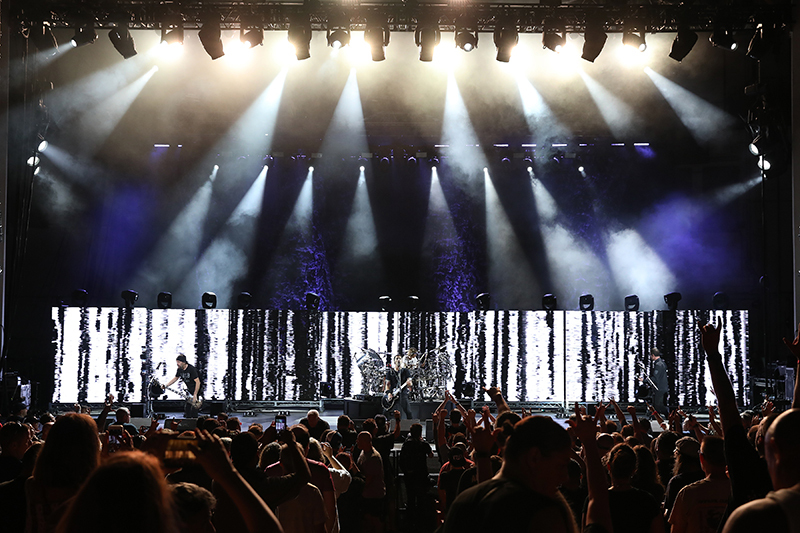 Behind Godsmack was an eight-foot-high Bideo wall that rolled in on eight set carts that were staggered so band members could walk through them to make an entrance. Breck placed another 14 Mythos2 lights on top of the wall of video, with four more as shin-busters behind it. The video panels were made up of 144 tiles of Screenworks X-12LTE 12mm LED product. All the content was pretty much split between media that Haggerty made himself and loops compiled by William “Viggy” Vignola. The video was all run through the MA Video VPU Dongle servers controlled by the same lighting desk. Both designers use the grandMA2 as their console of choice. Behind the video carts, there was a 60-by-30-foot Metal Mesh backdrop provided by Megan Duckett of Sew What? Inc. This giant crinkled bug screen was lit above and below by GLP impression X4 Bar 10 fixtures. 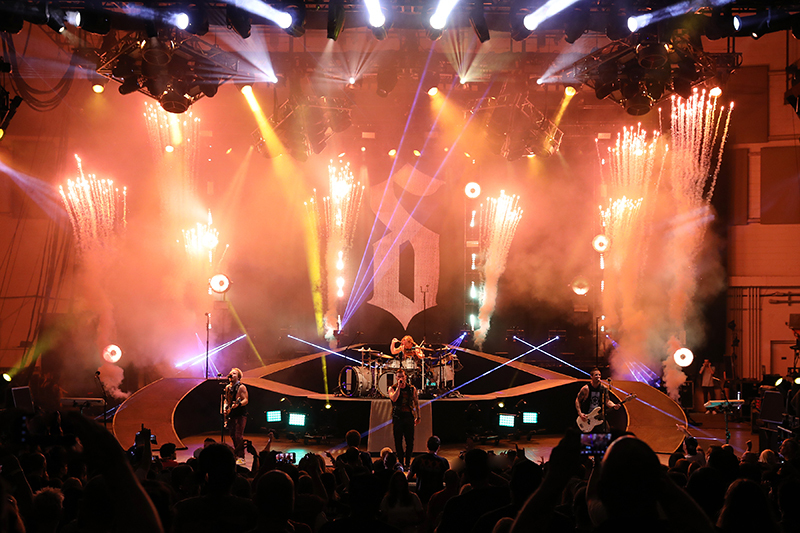 Scott Dunlop, the CEO for Pyrotek, notes that the effects company “has been working with Shinedown since 2014, and it’s been a great honor to offer our support across a wide spectrum of special effects options as they have evolved their live performance. 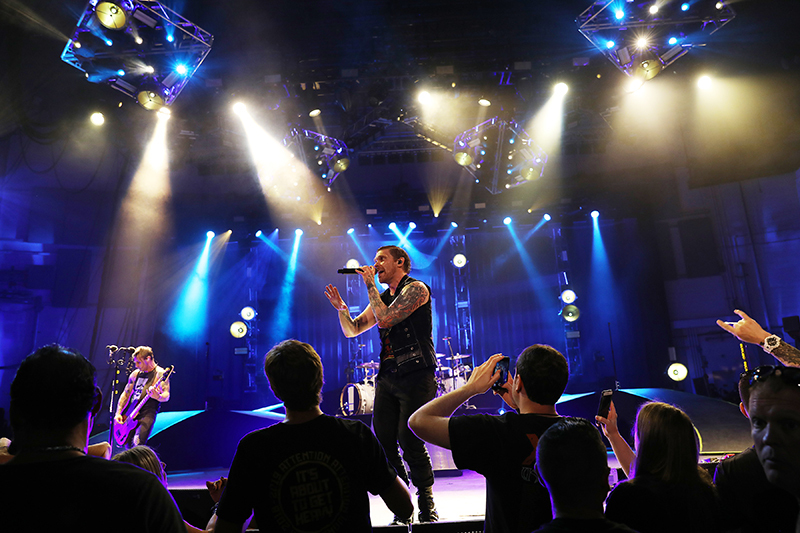 The band, and Brent Smith in particular, are heavily involved in creating the Shinedown live experience and have an unparalleled passion for using all the production elements available to them to create a feel and mood that lines up with the message of their music. Brent is a talented show designer in his own right, and it’s been great to see this show develop to the point where it rivals any production out there in terms of quality, visual impact and crowd engagement. 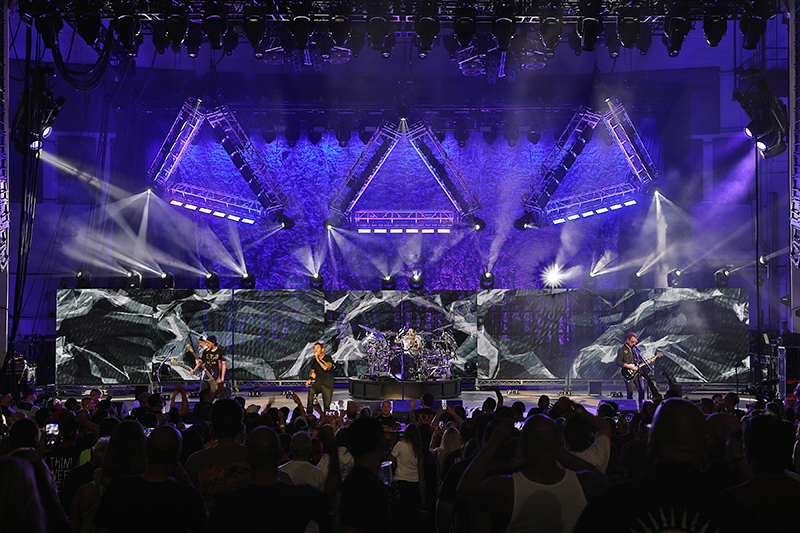 Godsmack used a variety of effects for their show, all supplied by Stage & Effects Engineering. 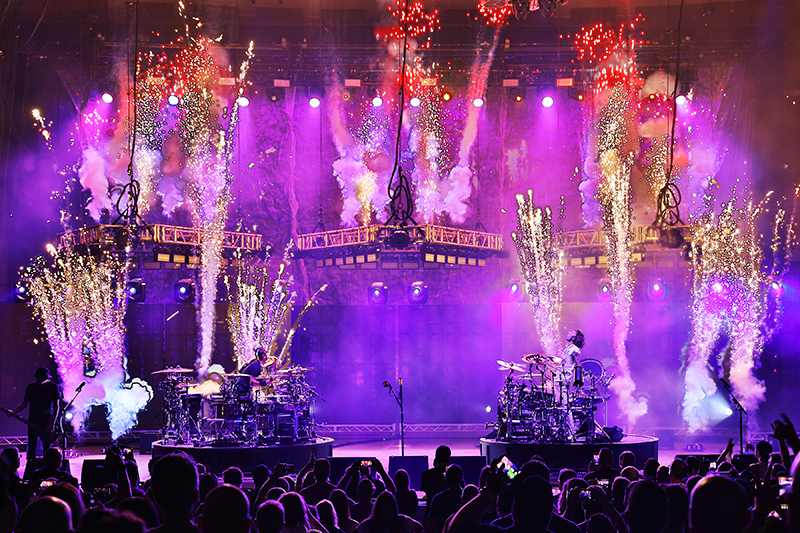 Stage & Effects’ Steve J talks about his team and their pyro approach. 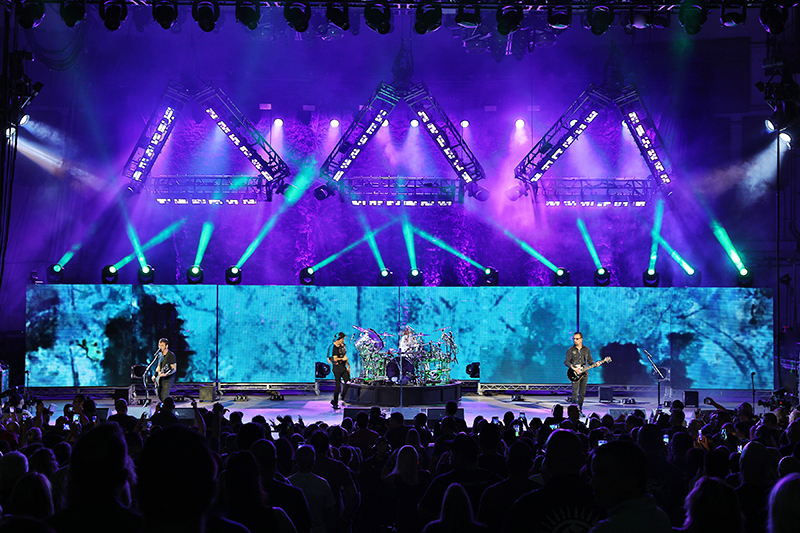 “This tour was a blast for us here at Stage and Effects Engineering — all puns intended! We have been doing pyro for Sully Erna and the boys for 15 of their 20-year career.” Steve J notes that he, along with veterans Fred Lee Price and John Ferrante, “worked closely with Sully on trying to come up with something new that the band hasn’t yet done. We saw the Shinedown show before the co headline run, so we wanted to give the fans something completely different. Sully is very pyro savvy and knows exactly what he wants,” Steve J adds. Steve J adds that Sully and he are both longtime Pink Floyd fans, “so seeing the infamous Pink Floyd ring explode with pyro was our inspiration for the triangles to do the same thing. Sully worked closely with Breck to get the angles and positions of the triangles just right, and then we shot 90 gerbs and five concussions off of them, aiming straight at the audience,” Steve says. “Sully then had the triangles land over the two drum kits during the dueling drum solo, in a flat, table top positions. We placed a dozen red mines along with more gerbs, and some flash bang concussions on the triangles shooting straight up. Carter credited Michael Strickland and Brent Barrett from Bandit for all the help and support with this tour, adding that Matt King, Mark Steinwach, and Jake Tickle should all be commended for their hard work. Breck, in turn, gave kudos to Carter for the accommodation and humor that made this tour livable. 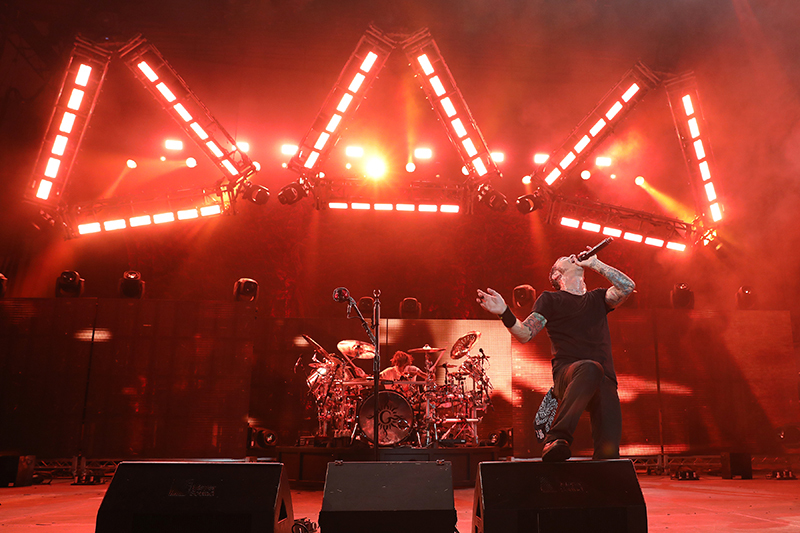 The co-headline tour wrapped up mid-October, but both acts are slated to continue performing more shows this year. Breck and Carter admit they are actually friends, and don’t battle each other over lights. 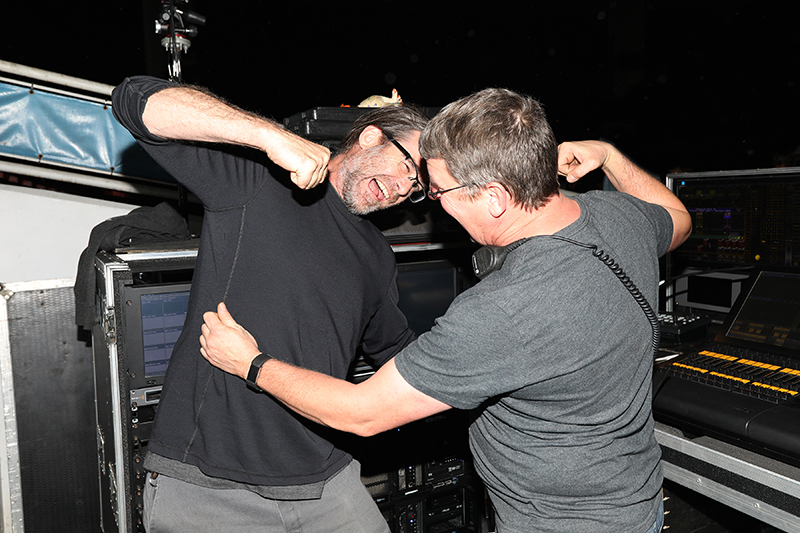 They leave their respective stage managers to duke it out for stage space daily.